The potential of Augmented Reality (AR) to support industrial processes has been demonstrated in several studies. We investigated the utility of optical see-through head mounted displays (OST HMDs) for industrial use cases. While there have been first investigations on user related issues in the long-duration use of mobile AR systems, to date the impact of theses systems on physiological and psychological aspects is not explored extensively. We conducted an extended study in which 19 participants worked 4 hours continuously in an order picking process with and without AR support. The results of the study indicates that the employed AR system does not increase users’ overall objective and subjective strain. Nonetheless, some users perceived increased eye discomfort. An ophthalmological check revealed that users with visual deficiencies tend to experience visual discomfort more likely than users without visual problems. Correct spatial registration of OST-HMDs relative to a user’s eye(s) is an essential problem for any OST-HMD-based AR application. Without this calibration no correct overlay of computer generated graphics on physical objects is possible. We investigated methods for enhancing the see-through-calibration. We focused on shortening the calibration duration, which can be a critical factor in industrial usage scenarios. We achieved a one-step calibration process with an optimized control point layout. While OST-HMDs enable observers to see additional information embedded in real environments., there is some evidence of that visual load can be increased when using these displays. We investigated visual performance when users performed visual search tasks or dual tasks only on the optical see-through device, only on a computer screen, or switching between both. In spite of having controlled for basic differences between both devices, switching between the presentation devices produced costs in visual performance. The assumption that these decreases in performance are partly due to differences localizing the presented objects was confirmed by convergence data. Irina Böckelmann, Daniel Schenk, Tobias Rößler, Simon Adler, Björn Senft, Jens Grubert, Rüdiger Mecke, Anke Huckauf, Mario Urbina, Johannes Tümler and Sabine Darius. Physiologische Beanspruchungsreaktionen bei der Anwendung von kopfgetragenen AR-Displays (Physiological Strainreactions through application of Head Mounted AR-Displays). In 51. Wissenschaftliche Jahrestagung der Deutschen Gesellschaft für Arbeitsmedizin und Umweltmedizin e.V. (DGAUM) (51th Annual Meeting of the German Association for Occupational Medicine and Environment Medicine). March 09-12, 2011, Heidelberg, Germany. Jens Grubert, Daniel Hamacher, Rüdiger Mecke, Irina Böckelmann, Lutz Schega, Anke Huckauf, Mario H. Urbina, Michael Schenk, Fabian Doil and Johannes Tümler. Extended Investigations of User-Related Issues in Mobile Industrial Augmented Reality. In Proceedings of the Ninth IEEE International Symposium on Mixed and Augmented Reality (IEEE ISMAR 2010) (pp. 229-230). October 13-16, 2010, Seoul, Korea. Anke Huckauf, Mario Urbina, Irina Böckelmann, Lutz Schega, Rüdiger Mecke, Jens Grubert, Fabian Doil and Johannes Tümler. Perceptual Issues in Optical-See-Through Displays. In Symposium on Applied Perception in Graphics and Visualization (APGV2010) (pp. 41-48), July 23-24 2010, Los Angeles, USA. Jens Grubert, Johannes Tümler, Rüdiger Mecke and Michael Schenk. Comparative User Study of two See-through Calibration Methods. In Proceedings of the IEEE Virtual Reality Conference 2010 (IEEE VR 2010) (pp. 269-270). March 20-24, 2010, Waltham, Massachusetts, USA. Johannes Tümler, Fabian Doil, Irina Böckelmann, Lutz Schega, Daniel Hamacher, Anke Huckauf, Mario Urbina, Rüdiger Mecke and Jens Grubert. 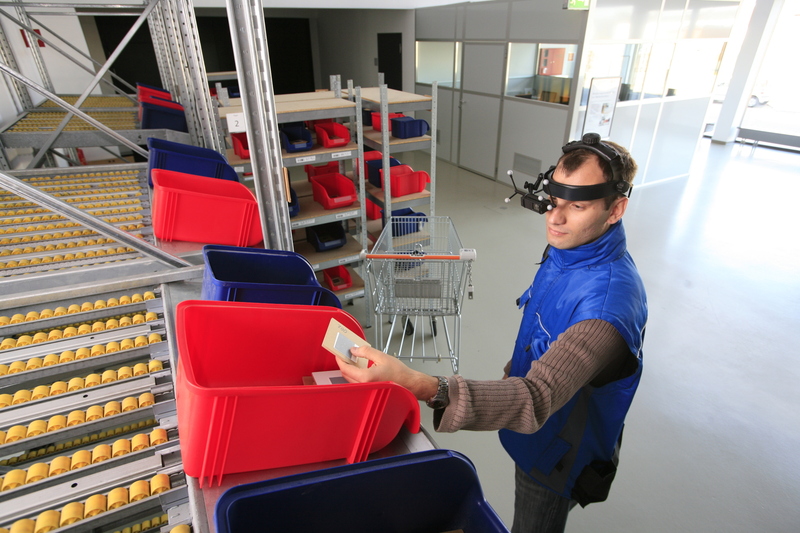 Nutzerstudie zum Einsatz mobiler Augmented Reality als Assistenzsystem in einem Referenzarbeitsbereich (User Study of mobile Augmented Reality as Assistance System at a Reference Work Site). In 13. IFF-Wissenschaftstage: Digitales Engineering und virtuelle Techniken zum Planen, Testen und Betreiben technischer Systeme (13th IFF Science Days: Digital Engineering and Virtual Technologies for Planning, Testing and Operating Technical Systems) (pp. 164-170). Fraunhofer Institute for Factory Operation and Automation IFF. June 15-17, 2010, Magdeburg, Germany. Lutz Schega, Daniel Hamacher, Janine Peters, Irina Böckelmann, Mario Urbina, Anke Huckauf, Rüdiger Mecke, Jens Grubert, Johannes Tümler and Fabian Doil. Psychische Beanspruchung beim Einsatz unterschiedlicher Optical See-Through Head Mounted Displays (Mental Strain of Using Various Optical See-Through Head Mounted Displays). In 50. Wissenschaftliche Jahrestagung der Deutschen Gesellschaft für Arbeitsmedizin und Umweltmedizin e.V. (DGAUM) (50th Annual Meeting of the German Association for Occupational Medicine and Environment Medicine). June 16-19, 2010, Dortmund, Germany. Jens Grubert, Johannes Tümler and Rüdiger Mecke. Optimierung der See-Through-Kalibrierung für mobile Augmented-Reality-Assistenzsysteme (Optimisation of the See-Through-Calibration for Mobile Augmented Reality Assistance Systems). In 12. IFF-Wissenschaftstage: Digitales Engineering und virtuelle Techniken zum Planen, Testen und Betreiben technischer Systeme (12th IFF Science Days: Digital Engineering and Virtual Technologies for Planning, Testing and Operating Technical Systems). Fraunhofer Institute for Factory Operation and Automation IFF. June 16-18, 2009, Magdeburg, Germany. Fraunhofer IRB Press Stuttgart. ISBN 978-3-8396-0023-8.